I love a good sheet pan meal! There is something so alluring about throwing fresh ingredients on a sheet pan and letting the oven do the work. This recipe packs bold flavor with minimal work. It's a simple toss and go that tastes like you spent way more time on it than you did. It's a personal meal prep favorite because I can be making at least two other meals while this turns into a delicious dinner! The spicy sausage with crunchy kale and caramelized sweet potatoes save well in the fridge. 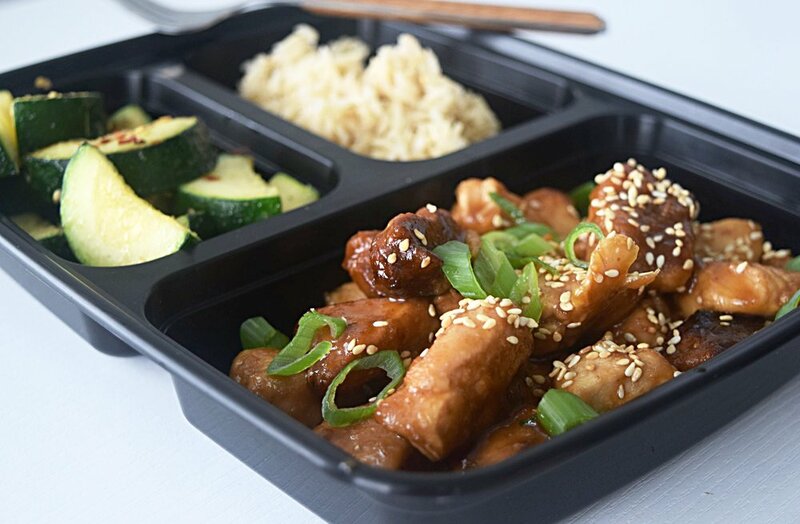 I meal prep this recipe and eat it for a lunch or dinner. I have occasionally eaten it for breakfast as well! Make sure you remove the sausages when they are cooked to prevent them from drying out! Heat oven to 375. In a large bowl, toss all ingredients except sausages. Pour veggies in an even layer onto a rimmed baking sheet. Top with sausages. Roast in the oven for 20 min until sausage skins begins to split. Remove cooked sausage to a cutting board and slice into bite sized pieces and cover with foil. Increase heat to 425 degrees and roast veggies until tender, about 10 minutes. Serve with sliced sausage and additional whole grain mustard if desired. It's Friday, and that means I am going to want to treat myself with a guilty dinner tonight! I pretty much always work Friday nights, so once I get off work I make a bee line for the nearest Panda Express. I don't know what it is about the fried rice, spicy kung pao chicken and tender zuchinni but I always get a craving for it on Fridays! However, did you know that for one 9.3 oz serving (so basically a little over 1 cup) of the fried rice it's 520 calories???? And for the kung pao chicken a 6oz serving is 300 calories! YIKESSS!!! I'm down to splurge every once in awhile, but I knew I needed to make a healthier option! A few weeks ago, I played around with a few versions of kung pao chicken. The winning recipe is made in the slow cooker so it can sit and cook all evening while I'm at work. Simply whip up some brown rice, sauté some zucchini and BAM! A low calorie version of my favorite Friday night dinner! The key to that pretty golden "fried" look on the chicken is to brown the chicken bits in a little cornstarch before adding to the crock pot! Add chicken and cornstarch to a large bowl. Toss to coat the chicken with the cornstarch. Heat oil in a large skillet. Add chicken to the skillet and cook chicken until just golden. Pour the chicken into the slow cooker. Add minced garlic to the slow cooker as well. Sprinkle sesame seeds and green onions on top of the chicken before eating! Add Sriracha to taste. Serve with brown rice, zucchini or any other vegetable mixture you would like! If you have never had a burger on a Portobello mushroom bun then you are missing out!! The rich flavor, satisfying texture and it’s unique ability soak up whatever delicious sauce you put on it makes it a must try. I like mushrooms, but had been skeptical for the longest time about trying to use it as a hamburger bun. How could anything be better than a soft whole wheat bun? After trying it, I quickly realized that even the pickiest of eaters would love this application of the Portobello mushroom! Make sure you don’t roast your mushroom caps too long or they will will get soggy and soft and won't be able to withhold the weight of a burger. Bake them just until they are tender and pull them out of the oven. If you have been following me on Instagram, you know that I am currently participating in the Whole30 challenge. One of the products I have really come to love is the chipotle lime mayo by Primal Kitchen, and no they aren’t paying me to say that lol! On a rushed weeknight when I don’t have time to make my own mayo, this spicy jar of goodness has saved me so much time! 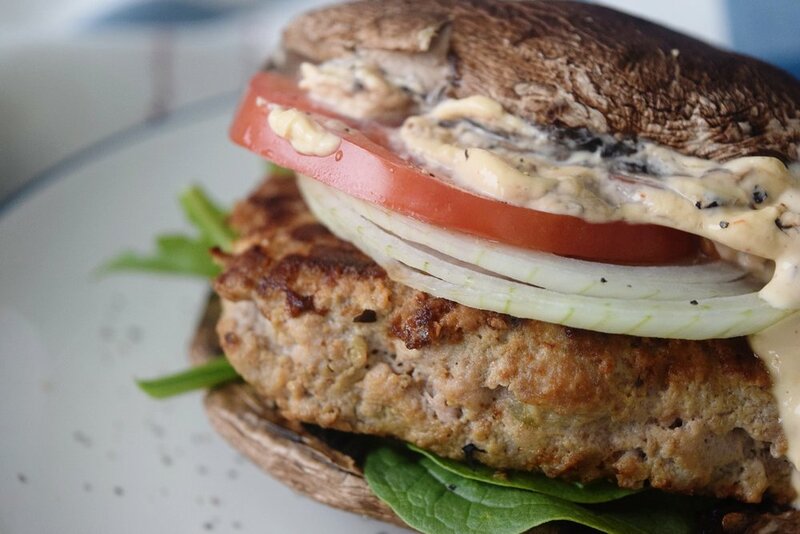 On this burger the spicy pop is a nice accent to the earthy mushroom! For the “buns”: Preheat oven to 400 degrees. Lay mushroom caps on baking sheet and drizzle with olive oil. Bake for 15 minutes until mushrooms caps are tender but not mushy. Set aside. For the burger: In a large bowl combine turkey, garlic, onion, spices and eggs. Stir until just combine. In a large skillet on the stove, heat olive oil until shimmering. Using a 1/2 measuring cup, drop burgers into pan and flatten with a spatula. Cook until golden brown on one side (about 3 minutes) then flip burger and cook until center is no longer pink. Assemble burgers with mushroom caps and top with tomato, onion, lettuce and mayo. Enjoy! Are you a fan of curry? I love a well balanced curry! For me all the flavors have to come together and blend into a slightly spicy, aromatic plate of goodness. Enhance too much of one flavor and I'm usually not a fan! This coconut chicken curry is fast and easy to make but has a wonderful rich flavor. I used zucchini noodles instead of rice to keep it Whole30 compliant, but to be honest I prefer the zucchini noodles to rice. They add a light crunch to the dish and really fill you up! Coconut cream creates a delightful rich sauce that will have you scraping your plate to get every drop! Feel free to adjust the spice in this dish, if you like a hearty curry flavor add 1/2 teaspoon more curry powder than this recipe calls for! In a large skillet on your stovetop, heat oil until shimmering. Add chicken to the skillet and cook until no longer pink in the center. Remove chicken from skillet and set aside in a small bowl. Add a bit more oil to the pan and add curry powder and cumin. Stir and toast until spices are fragrant. Add garlic, onion, and peppers and cook until just tender. Add in coconut cream, lime juice, cooked chicken, baby spinach and zucchini noodles. Cook until spinach is just wilted and noodles are crisp tender. Top each plate with a pinch of cilantro.